Didn’t really use any one specific source, but rather a mash-up of several. I try to keep my recipes simple and straightforward with minimal ingredients! Notes: Super easy to make! 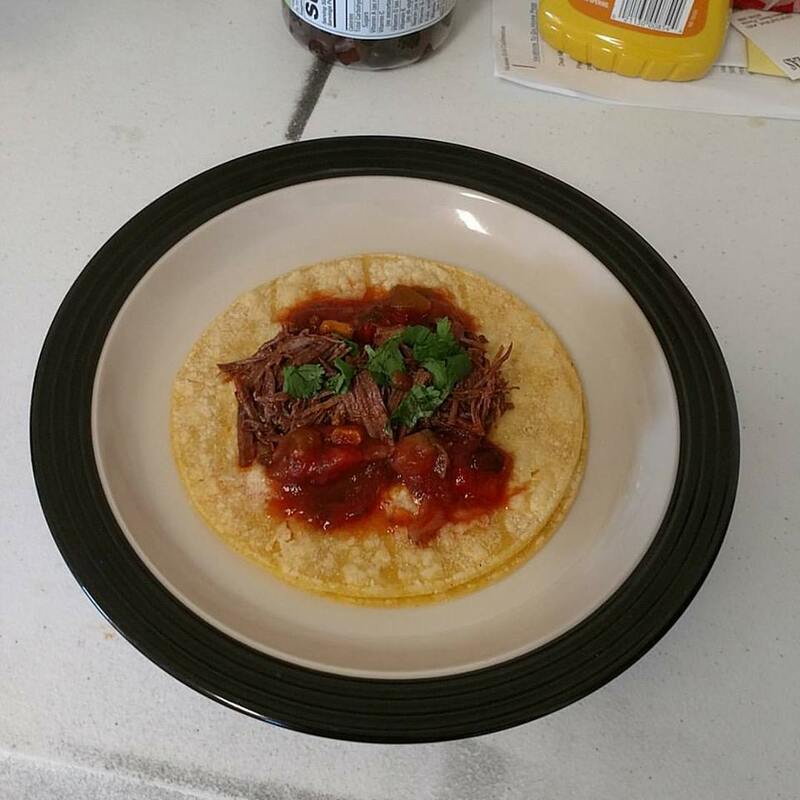 I mostly followed the directions on the Frontera packaging and then cooked in the Instant Pot on manual for 65 minutes. Prep your beef chuck and onions. Cut the beef chuck into 2″ cubes and lightly season with salt and pepper, then set aside. The beef chunks doesn’t have to be precise. Thinly slice the red onions and set aside also. Oil the bottom of the Instant Pot pan and set the Instant Pot to saute. Add the onions and slightly saute. Add the beef cubes to the Instant Pot also and allow the cubes to lightly brown. After all the beef cubes are browned, give the onion/beef cube mixture a nice mix. Add the 1 package of Frontera Barbacoa marinade and 2 cups of water. Make sure that the two are well mixed. You can do this in a separate bowl, but I chose to mix it in the Instant Pot to avoid cleaning another bowl. Cook on Manual for 65 minutes. After cooking, do a pressure Quick Release. Remove all the cubes, then shred. The cubes should be really easy to shred. If they aren’t, you might need to cook them a little longer. Return the shredded beef to the marinade. For best flavor, allow the shredded beef to soak in the marinade for several more hours using the Keep Warm function on the Instant Pot. 4 garlic cloves, bruised KB: I forgot to grab these so I went ahead without them. 1-2 cups of water KB: I tried to keep the ratio 1 cup of liquid to 1 lb of pork. In this case, I ended up using 2 cups of water and 1 cup of liquid carnita seasoning. KB: I ended up using this for seasoning. 8 oz. packet of chipotle-lime carnita seasoning. This and 2 cups of water ended up being 3 cups of liquid to my 3 lbs of pork shoulder. Cut up the roast into 1.5″-2″ cubes and put all the ingredients in the liner of the Instant Pot. KB: Water, liquid spices, seasoning, salt, pork shoulder, and bayleaf. Close and lock the lid, making sure the sealing knob is on sealing. KB: Instant Pot Manual Mode for 45 minutes. Once the cooking is done, you can release the pressure by the quick or natural pressure release. Option 1: Heat up a frying pan and add some oil. Fry the pieces of pork until nicely browned on both sides. Option 2: Spread the meat out on a sheet pan (KB: Shred the carnitas. You can use a fork or similar to just crush them. They’ll fall apart easily.) and place under broiler (KB: On Hi.) until nicely browned and turn them over and brown the other side. KB: We ended up using option 2 as it was a much cleaner method. For best results, we recommended you really allow the carnitas to burn. Get them to a nice dark brown color/almost black. Some burning is GOOD! Experiment and see what works best for you! Serve with rice, beans, salsa, guacamole and sour cream. You can also make burritos or tacos. Super easy and super delicious. 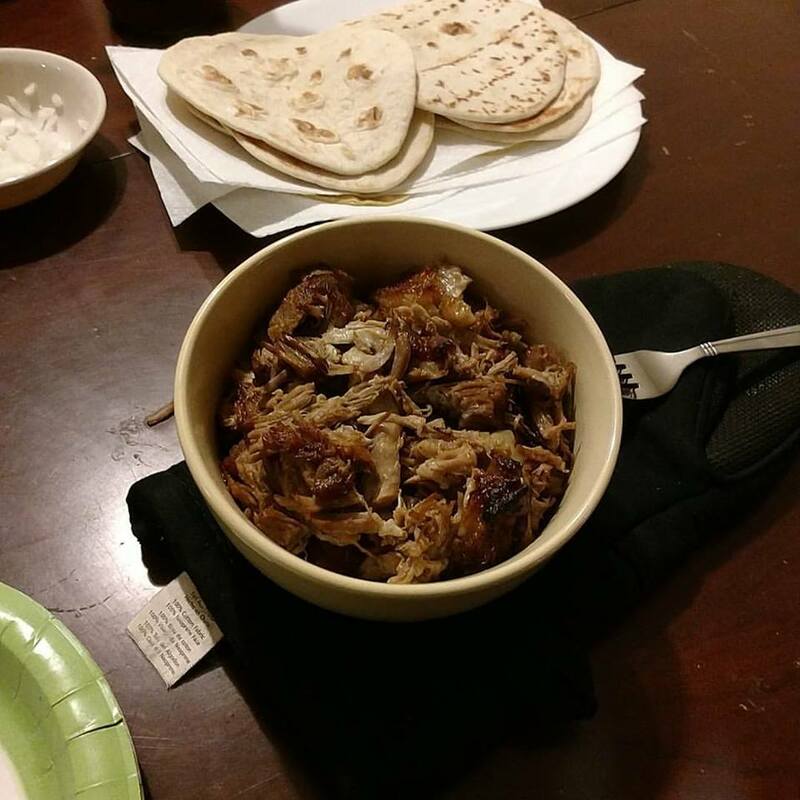 3 lbs of pork shoulder was enough to serve 4 people. We ended up using the carnitas for tacos. Corn tortillas and topped with cilantro, onions, and lime juice.